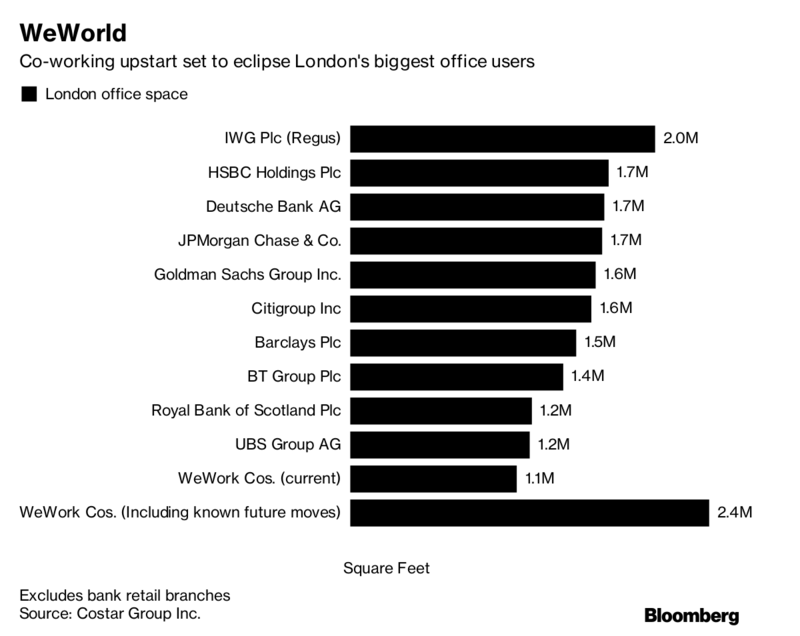 Providing a flexible office space solution, WeWork (a 7 year old US start-up) is on course to become the largest private tenant in London after just 3 years upon entering the UK property market (data compiled by CoStar Group). 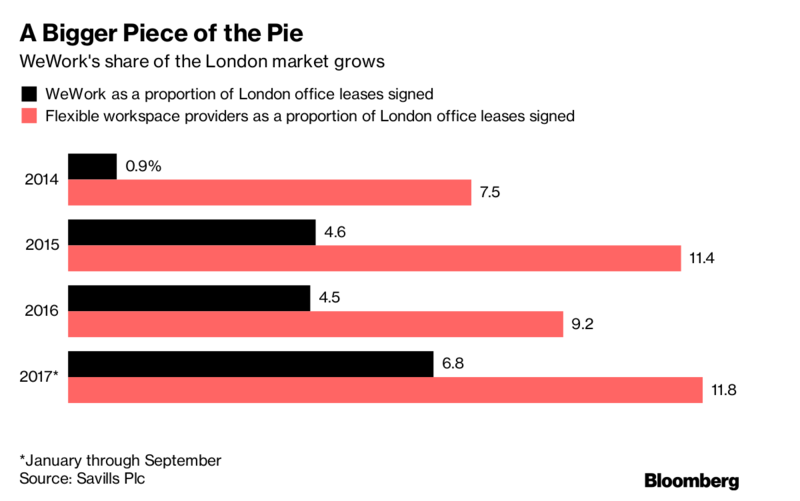 WeWork’s success in London is reliant on demand for flexible office space growing fast enough to keep rental income above the historically high rates the company pays to lease its properties. The firm currently operates 17 London locations, with two more opening soon and a further 10 announced. It has also begun buying some buildings and is in talks to purchase a 12-building campus close to Liverpool Street station for about 600 million pounds. Jamie Hopkins, CEO of WeWork competitor Workspace Group Plc, said he prefers a business based on purchasing the properties the company rents out as short-term offices. “Buying long-term leases and selling short ones at a profit is not a model we are comfortable with at all,” Hopkins said in an interview. Owning its buildings gives Workspace “much more flexibility in terms of pricing if we need it,” he said. There were almost 1,140 serviced office and co-working facilities in London in April 2017, up from around 490 in 2012, according to data collated by broker Instant Offices. London remains one of the world’s most expensive office markets even after the Brexit vote. 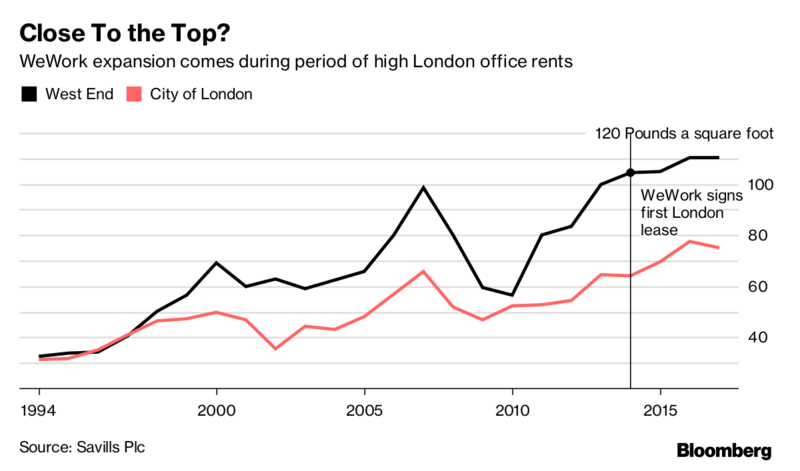 The U.K. capital’s West End district ranks as the second most expensive globally with an occupancy cost of £160 a square foot a year while the City of London borough, where WeWork’s largest building is located, ranked 11th, according to a June report published by broker CBRE Group Inc.